Whew! With Charlie and the Grandmothers now out on shelves (go on and get it! And when you've read it, leave a review? ), I'm super busy making sure everyone knows about it, but I'm also catching up on other projects I've had to put aside while I wrote. So, here's a rundown of all the things I've got in store for YOU! SKARED YET? 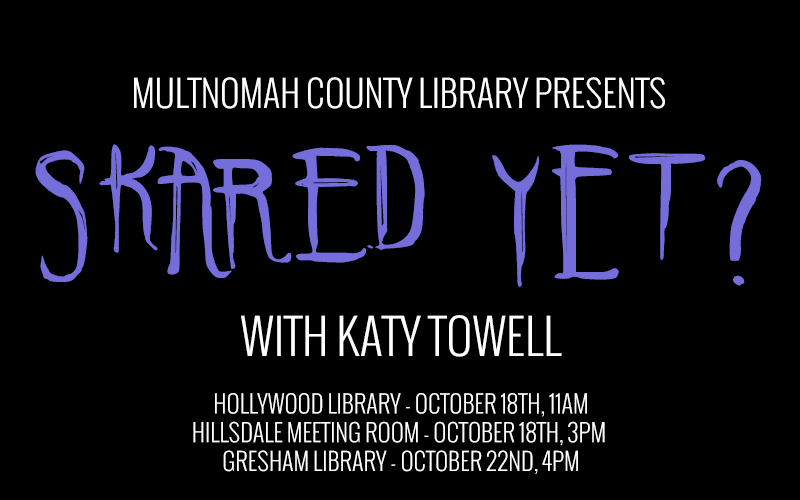 (Multnomah County Library) If you're in the general Portland, OR area, I'll be doing workshops at the Hollywood, Hillsdale, and Gresham libraries this October! Bring your kids dressed as their greatest fear and come prepared to learn about scaring others through drawing and storytelling. The Gresham event is for teens, by the way. I promised the librarian it would be extra gross. The other two are will be safe for the younger bunch. Click here for details! Thorne & Cross: Haunted Nights LIVEI'll be doing a live interview on September 17th at 8pm eastern/5pm pacific on Haunted Nights LIVE. I'll post more details when I have 'em, but it's bound to be a good time. Check it out! I got a real microphone! (Finally, you say.) This means I finally have something decent with which to record my next Book of Skary episode (FINALLY, you say louder). And I may turn the Book of Skary into a podcast as well, something like the old Sixcasts I used to do. I'm writing a story for this right now, but in the mean time, listen to my first (and so far only) episode called The Winterlord. NEW ANIMATION SOFTWARE I'm finally switching away from ye olden Adobe Flash and moving on to Harmony 12. I'm in the process of learning this newfangled technology right now, and I intend to use it on my next animation: Mouse & the Dragon (narrated by Tim Jones). I'm pretty excited about this. I've only just started the tutorials, and it's already loads better than what I was using. And lastly (but not leastly): I'm working on a new book! I have no idea yet if it will see the light of day, but I'm working on one, so I can say that. That's all I can say for now, though. We'll see what happens. WE. SHALL. SEE.